This problem follows on from Changing Areas, Changing Perimeters. Here are the dimensions of nine cuboids. You can download a set of cards here. As you go from left to right, the surface area of the shapes must increase. As you go from top to bottom, the volume of the shapes must increase. All the cuboids in the middle column must have the same surface area. All the cuboids on the middle row must have the same volume. What reasoning can you use to help you to decide where each cuboid must go? The ticks represent the nine cards you've already placed. Can you create cards with dimensions for cuboids that could go in the four blank spaces that satisfy the same criteria? 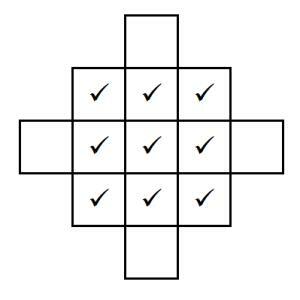 Can you design a set of cards of your own with a different cuboid in the centre? 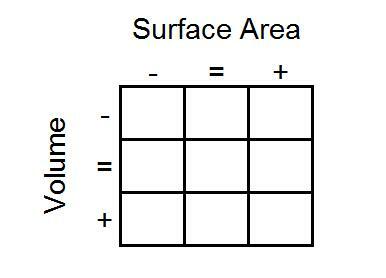 Surface and surface area. Cubes & cuboids. Polyhedra. 2D representations of 3D shapes. Spheres, cylinders & cones. Volume and capacity. Interactivities. Nets. Visualising. Maths Supporting SET.